In my favorite photograph of the two of us together, my granddad is carrying my toddler self on his shoulders. I’m holding onto his crown of white hair while he’s holding a wildflower that we must have plucked along the trail. This picture resonates with my most vibrant memories of my granddad as always full of kindness, laughter and lively conversation. It wasn’t until my 5th grade teacher suggested that I look him up in an encyclopedia that I realized that my granddad was also a scientist who had investigated and answered some of the most important scientific questions of the 20th century. 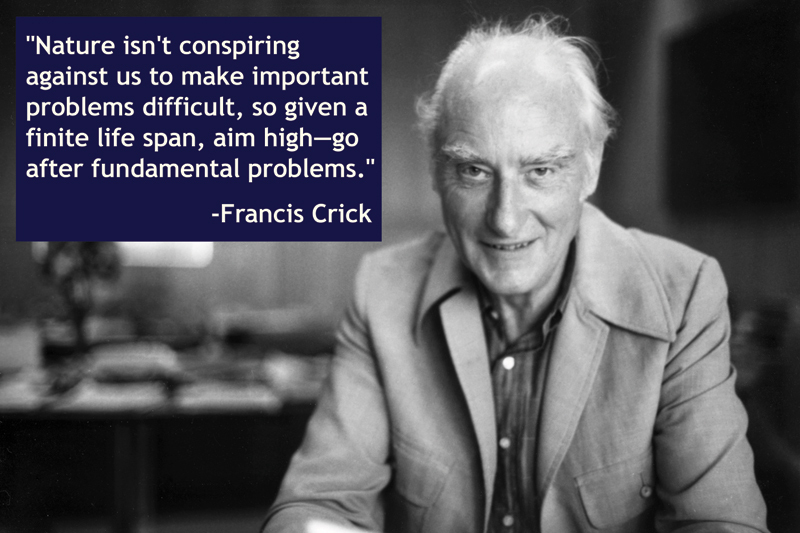 Francis Crick, along with James Watson, is famous for unraveling the double-helical structure of DNA and deducing from its chemical structure its key function of storing and copying genetic information. For this discovery and revolutionary insight, they were awarded the Nobel Prize in 1962. Some people today dismiss Watson and Crick’s work as theft, having been told that they stole Rosalind Franklin’s data. This is not true. A key bit of data they used came from an internal department report intended to share MRC findings between labs and from her initial critique of their incorrect structure. Rosalind Franklin’s data was key to the double helix model they built. The Watson-Crick model brings together additional data and adds two unique insights – the two spirals twisted in opposite directions allowing for specific base pairings (A-T and G-C) to fit neatly inside. They then made the leap that secured them the Nobel Prize: DNA was a code. My granddad also spoke to me of his admiration of Rosalind Franklin’s work not only on DNA but her further work on viruses. She corresponded on scientific matters with my grandad, was friends with my grandparents, and she chose to stay with my grandparents when recovering from cancer surgery. She is a hero of mine. I was in a privileged position to hear first-hand that ‘Jim’s Book’ should not be taken as a historical account. Jim wished to show the messy human side of scientific discovery. It reads like a good mystery novel. Memorable scenes such as them winging it into the Eagle pub and Crick announcing, “We have discovered the secret of life!” are fiction. But, as I was later told by Watson, this narrative captured the spirit of the moment in the pub that day. If you truly understand what they saw in those paired bases, you can understand the sense of awe they must have felt – that is, if they were right. It would take almost a decade for their ideas to gain acceptance and not until the 1970s for the DNA structure to be proven. It was in his inviting office overlooking the Pacific or in the shade by the pool at home that he distilled ideas with Christof Koch and brought scientists together to work on one of science’s greatest unsolved mysteries: consciousness. Their quest was to discover the neural correlates of consciousness – the biologic circuitry that makes animals aware. I was lucky enough to join him during meals with fellow scientists where he would listen, ask probing questions, and engage in intense dialogues. These exchanges were a friendly crucible for new ideas, often launching the participants in brilliant and unexpected directions. On occasion, we took trips to my grandparents’ home in the Anza-Borrego desert where they nurtured their extensive desert garden. This retreat was my granddad’s oasis of peace where he could hike, read and think. There was an amazing silence in the desert and the Milky Way would illuminate the clear night sky. 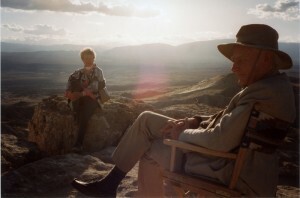 I remember us sitting at the cliff’s edge at Font’s Point to watch as the sun slowly sank behind the wrinkled maze of hills and razorback ridges below. Light and shadow played across this fascinating backdrop, a canvas reminiscent of the deep and unfolding landscape of the brain, not just in its form but also in its seemingly impenetrable mystery. He lives on in my memory, the network of cells that linked up with my experience, and the nets still holding those synapses together when I think of him. I miss him dearly.